So I set out to create the best search I could. What really got me started was the release of the new search feature of Trello. It was fast, introduced useful search operators, and was just fun to use. I wanted Devpost to have a similarly badass search. 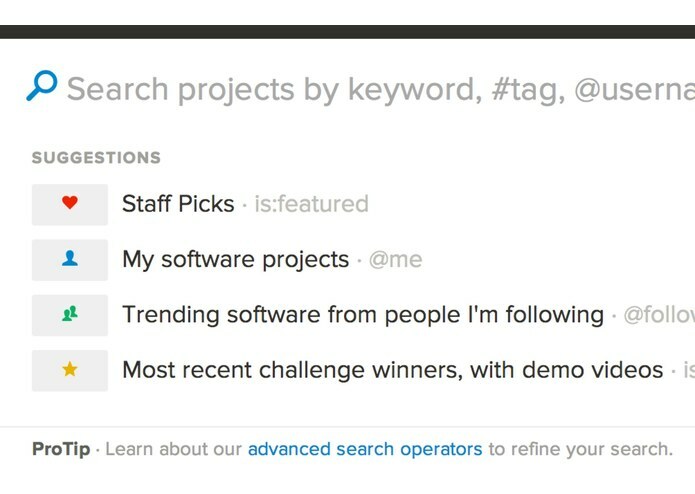 I also took some ideas from the facebook search, as well as GitHub's and Evernote's for the search operator's syntax. Operators are a huge part of what makes the CP Search fun. Searches through the projects of your friends. I really like this one in combination with the at: operator. at:"Product Hunt Hackathon" has:video will allow you to watch all the videos made at the Product Hunt Hackathon for instance. I find it very useful to keep up with all the cool projects published on CP. published:week is:popular will show you the most popular projects of the week for instance. Gives the user ideas about interesting queries. A possible improvement would be to make them dynamic, and recommend searches based on the recent hackathons. 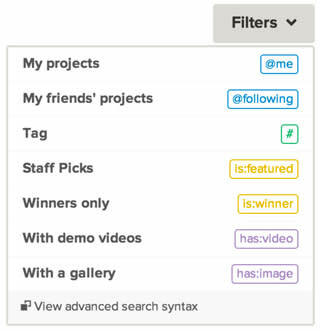 Filters are just a way to make using operators a bit easier by allowing the user to pick from the most popular ones. Next step, borrowing some code from Marionette.js, and using Backbone.radio to handle events. My first approach to handle these was simplistic and regexp-based. It worked well for a while, but I quickly reached its limits when I decided to add more complex search operators, like published:week likes:>5. Parslet makes it dead simple to create parsers. So I basically just had to write the grammar defining a search query. The issue is that a Parslet parser returns huge, nested hashes when parsing a complex query like '@"robin" #ruby is:winner published:year-1..2014-01-01'. Thankfully, they thought of everything, and Parslet comes with a hash transformation engine (Parslet::Transform). It provides a mechanism for simplifying and interpreting these nested hashes easily. All in all, Parslet has been a crucial piece in the implementation of complex search operators, while keeping the code clean, easy to understand, maintainable and extensible. I'm very happy with how this project turned out. It's fun to use, powerful, polished and full of details that are usually absent from other features that we have to release fast. I also really like the fact that it makes other part of the application simpler by providing a "text api" for searching projects. I learned a lot about Backbone.js, and Parslet. Moving from Solr to ElasticSearch. One day, it'll happen. Came up with the idea and implemented it over a long period of time.